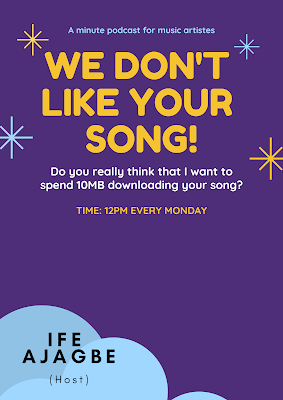 Do you really think that I want to spend 10MB downloading your song? The second episode of the, ‘We Don’t Like Your Song!’ podcast talks about why music artistes should reconsider sending heavy audio files to Media Personalities (including bloggers. The host, Ife Ajagbe has garnered experience in 10 years (Zuma FM, Gold FM, Metro FM & Lagos Talks) of being a Media Personality. This podcast is genuinely born out of a passion for Nigerian artistes and the need for the upcoming acts to get the attention of the media space by getting the basics fixed. The issues that have been raised in this podcast are the real reasons some songs never get attention from Media Personalities in the first place. All 13 episodes are already on SoundCloud but the video files will be uploaded on YouTube every Monday. You are an important part of this conversation so your feedback would be appreciated.